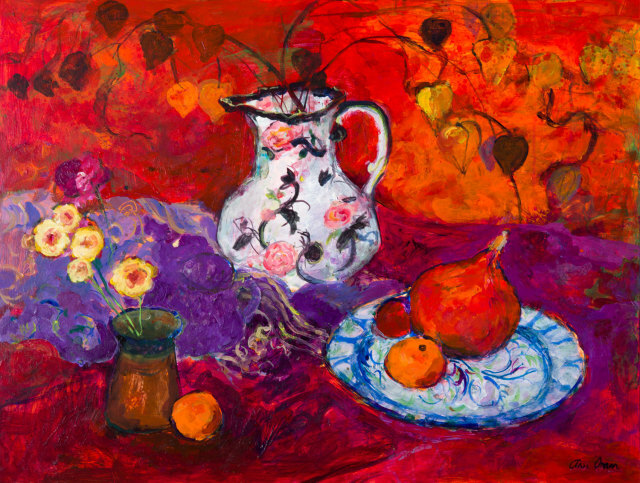 Ann Oram RSW (b 1956) is always present in her surroundings, painting with an abundance of colour and energy. Her beautifully composed landscapes and still-lives often focus on the overlooked beauty and minute details found around her studio or on her travels. Oram is a grand tourer in spirit and keen observer of life, having spent many years living and working in Europe and India. Oram describes her work in the context of the everyday, choosing to depict “the ordinary landscape of Scotland. There are no heroic mountains or lochs; the views are about what I see most days and know very well.” Oram is a great observer of the seasons; the stark clarity and simplicity of winter and the profusion of wildflowers in meadows or her garden in the summer. Oram also finds inspiration inside where she paints much-loved objects using the balance of colour, line and form only a lifetime’s experience can bring. Ann Oram RSW was born in London and trained at Edinburgh College of Art. After her post-graduate year and Andrew Grant Scholarship to France and Italy, she returned to Edinburgh to lecture in painting at ECA. Her work appears in corporate and private collections throughout Britain and Ireland, USA, Singapore, New Zealand, Spain, Austria and the Netherlands.